TEDxOdense had the pleasure of sitting down with Executive Vice President, Eva Berner, of Orifarm for a talk about their vision, mission, and values. Can you tell us who you are, and what your position with the company is? Yes, I can. My name is Eva, and I’m 49 years old. I have an MBA in strategic leadership, employment law, and organizational change from Aarhus School of Business back in the Stone Age, a long time ago! And I’ve been working for Orifarm for the past 6 ½ years. Recently I got the opportunity to be head of HR and Communication. I’m part of the senior management and the executive board alongside our CFO and CEO. I live in the countryside in Faaborg, with my husband, Ditlev, who I actually met while studying—he has the same education as I do! We have three daughters; Emily, Minna, and then Augusta, the youngest. And in my spare time I love nature and sports. So that’s who I am! Can you tell us a little bit about Orifarm as a company? And how do you think Orifarm stands out? Orifarm is a privately owned company, celebrating its 25th year anniversary this year. What characterizes Orifarm is that it’s very entrepreneurial. We have strong values, and everything we do is founded in our values, the mission, the vision. We live what we think is important. And we sell medicine from two different business units; one is Parallel Import of original medicine. When pharmaceutical companies create medicine, and they distribute it to different markets, the price differs within Europe, so we buy it, repack it, and sell it in our own name. That’s one part of the business. The other part is called Generics. That’s copy-medicine. It’s the same active ingredients as in other medicine from other companies, but it’s no longer patented, so we produce the same medicine and sell it in our own name. And then we have the third part—and that’s where I think there’s such a brilliant match with TEDx— where we’re working with innovation and digitalization, synergistic growth from our existing business. So we’re actually, right now, creating a whole new department, where they’re working with new business methods and new ways of doing things. We’re 1100 employees, with offices all over Scandinavia, and we buy in the rest of Europe. So we’re an international, European-founded, privately owned company with strong values. You say it’s a company full of values, so how do you think Orifarm is very visionary? I think we’re very visionary in the way that part of our foundation and vision is to create savings for society. To get affordable medicine to the end users, the public. And to do that, we’re challenging the original pharmaceutical industry. We try to do things differently. Of course, we respect what is, but we’re always looking for what could be, what might be. We’re also very visionary in the way we work with talent and with young employees. We have a lot of students working for us, because we like new ideas and perspectives from people who see the world differently compared to some of our more grounded forces. Also, we have very strong—not necessarily well defined, but pretty ambitious—ideas about what we want to achieve and what we would like to do. And with the way we do it and how we can do it, there we keep challenging ourselves. So, we’re looking beyond what is, and more at what could be, specifically by being open in the way we do our business. Of course, it’s a highly regulated business, but we’re always keen on doing things differently from what we’ve done in the past. 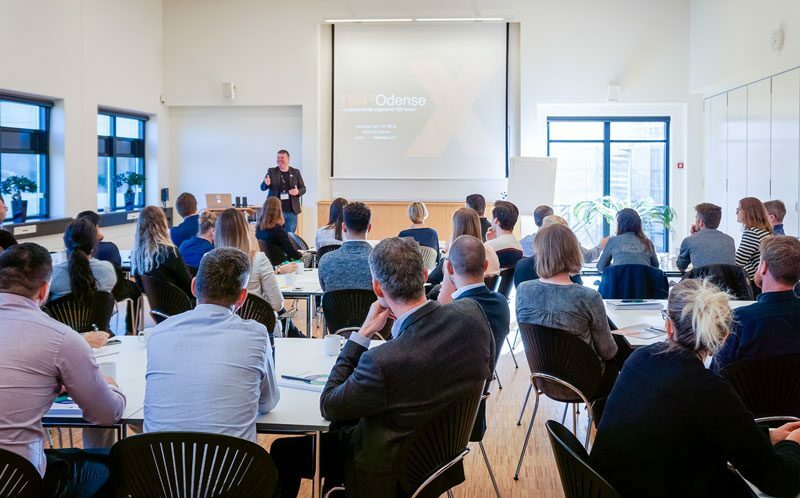 Orifarm joined TEDxOdense as a visionary partner again this year. What are the reasons behind that? Yes, this is our third year partnering with TEDxOdense! I think the match is of course in the exposure to new ideas and new ways of thinking. Before we entered this partnership, a lot of us at Orifarm liked TED and TEDx videos and used them in meetings and for inspirational purposes. So a lot of us were familiar with the concept already. And it just seemed like such a good match because it was something we could use and apply internally in the company. I’m personally a very big fan of diversity in all senses—education, age, gender, nationality—and I think this diversified way of thinking and the diverse audience of TEDx is a brilliant match for us. So I think we can grow together because there are a lot of similarities. Even if the actual products aren’t that similar, the vision is. You talked a bit about how both Orifarm and TEDx both have high values, how do you think they match up? I think there’s a good match, because of our core values. Ambition, responsibility, being customer-centered, and also in our flexibility. And everything we do; the way we do our training, on-boarding, leadership-training, all of it has been founded on and grounded in these values that we have. There’s a good match between, at least I think, the foundation of TEDx, the way it’s co-created, the ambition level, and in how it looks beyond what already is. Those are things I think make for a great match with Orifarm. Pharmaceuticals and motivational talks are not necessarily similar, but here I will say that we have to differentiate, seeing as Orifarm is not an original producer, but more copying products and distributing and selling others’ products affordably. So what this business is actually all about is people. That might sound a little cliché, but it really is all about people and mindset. So the product could have been a lot of things, because in the end it’s not about pharmaceuticals, it’s about the people leading, doing, and contributing to the business. And here again I think diversity and competencies are the key words. We need a lot of skilled employees, and therefore I think, pharmaceuticals, that’s the product, and of course we respect it, but in the end, it’s all about people! What are you most excited about for this partnership? I think personally, I like the diversity, the new inspiration, and to do things differently. But from a company-perspective, I’m excited to inspire our employees. And I’m very proud of being mentioned, and that I get to be there, and get the opportunity to share it with our employees, so they can be inspired as well. And last year and this year, we’ve also had the privilege of having TEDxOdense here giving the Talk like TED workshop. That was really something we could apply in the business afterwards, in the way we present. That’s more the internal perspective, though, but what I’m all around just very proud of is getting to see things in new perspectives, get inspired, do something differently, have a vision, and contribute to something larger than ourselves. That’s what I would like our business to do. And I’m excited to come to the event again this year for all of that!